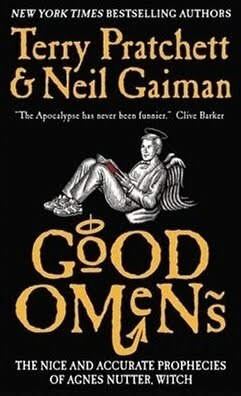 Good Omens by Terry Pratchett and Neil Gaiman: A Comedy About the Apocalypse?? Hi guys! I recently finished Good Omens by Terry Pratchett and Neil Gaiman (a comedy about Armageddon), and I thought I'd post a review! I hope you enjoy! So the armies of Good and Evil are amassing, Atlantis is rising, frogs are falling, tempers are flaring. Everything seems to be going according to Divine Plan. Except a fussy angel and a fast-living demon - both of whom have lived among Earth's mortals from The Beginning and have grown rather fond of the lifestyle - are not actually looking forward to the coming Rapture. I really did enjoy this book. Although it had a bit of a slow start, and there were a few bits where it dragged, the whole second half was awesome, packed full of high-action and witty comedy. There are some extraordinarily funny scenes strewn throughout the book. I definitely recommend it. From Anathema's homey little cottage to Crowley's impeccable apartment and all the places in between, the settings in this book came to life right off the pages. You could perfectly envision what everything looked like, and it felt like you were really there. Very intriguing, with some really creative and interesting twists and turns. Someone has lost the Antichrist? A modern witch can tell exactly what's going to happen to her because of prophecies an ancestor wrote about her? Although a few elements, like all the main characters converging at the end, just like in the movies, seemed a little cliche and done and done over in the fantasy/sci-fi world, I really enjoyed it overall. The characters in this book were all extremely lovable and quirky. Aziraphale and Crowley (the angel and the demon) are unlike you'd expect them to be, and Crowley's witty commentary throughout the book was super hilarious. Anathema is pretty darn cool and ultra relatable, and Newt, although he had a slow start, grew throughout the course of the book to become one of my favorite characters in the end. The only character I felt lacked was Shadwell. He never seemed to have much depth of thought or emotion and was almost always pretty one-dimensional. I would have loved seeing some inner conflict from him, or at least have more of his thoughts revealed to the audience. 4.5 out of 5 stars. Despite some parts where it drags, this book is hilarious and extremely well-written, with an outstanding group of main characters and some awesome plot twists. Well, that concludes today's post! Have any of you ever read Good Omens? What did you think about it? Comment below! I find that even more amusing than the lizard cult or whatever it was a few days ago. "Oh no. Where did you wander off to now? Heeeeeeere, satan! Here, boy!" "Excuse me sir, I seem to have lost my antichrist. Have you seen him anywhere? Red? Looks like a human-goat cross breed with a pointy tail? Answers to satan? No?Thank you anyway." I think I must read this. All of your reviews are so helpful and this done sounds fantastic. A comedy about the Armageddon! I laughed so hard reading your comment Gwen you're the best. Have you read any of Lemony Snicket's books(he's famous for A Series of Unfortunate Events.) Gaiman's writing style reminds me strongly of Snicket's and perhaps Terry Pratchett might join the club. Yup, I read the first half of a Series of Unfortunate Events.